September 5, 2018 / J.K.
After the murder of her father, Mattie Ross tracks the culprit to Fort Smith, Arkansas where she enlist the help of the Marshall Rooster Cogburn. He eventually takes the case, after meeting a Texas Ranger who is also chasing the man for various other crimes. After telling her no, the men begrudgingly accept that she will come with them. They head into nearby Indian Territory, where the eventually find the man and others in hiding after a train robbery. 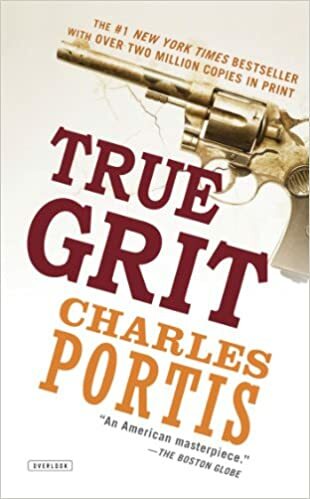 Portis waste no pages of this short book with writing that isn’t action. The book starts with the murder and then Mattie heading to Fort Smith and doesn’t stop until the final few pages as he concludes the book. Interestingly, the book is written form the perspective of Mattie, who is looking back and telling the story. I think this adds to the quick and action-packed pace. The three main characters are all unique and compelling, even if they a little cliched. Two movies have been made from this, I’ve seen neither, but know that the Ranger is played by Matt Damon in the most recent one. From the movies where he has tried to be unlikable, I think that fits well. Cogburn is most in line with the grizzled not necessarily lawful anti-hero, while Mattie is more head strong and stubborn. Each character is somewhat iconic in fiction. In case you were wondering, ‘true grit’, is the term she uses when explaining what she was looking for in a Marshal to track the murderer. It is a compelling story, though the ending felt rushed. There are some of the usual tropes, but there were also a few surprises and twist. Overall, it is a fun, easy book to read, definitely one for the beach/vacation. It is also an American classic, so a novel to put on your list.